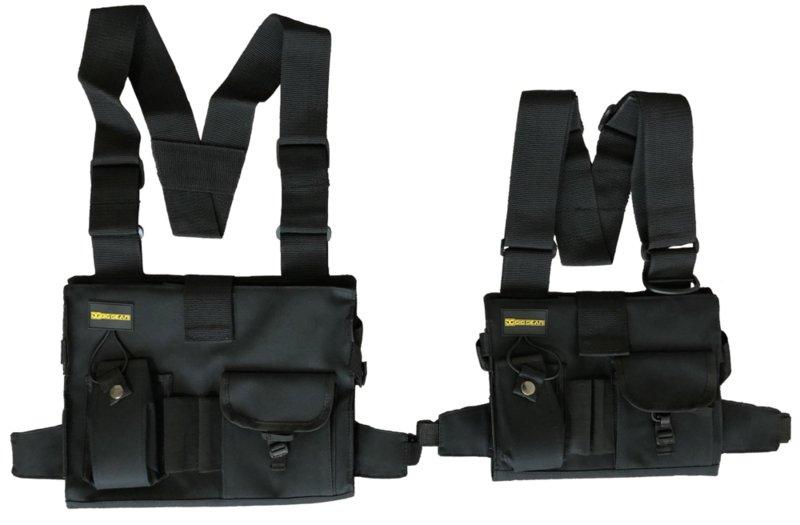 The Two Hand Touch harness is an iPad or tablet holder worn on the users chest that allows the user to interface with a tablet without having to hold it in one hand. This frees up both hands to interface with apps as well as have both hands available to perform andy required tasks or work. Live sound engineers, lighting designers, stage crews, theater techs, film pros, floor managers and many other production pros are all making use of the convenience and incredible technology built around the wireless capabilities of iPads & tablets in live entertainment and production environments. However, the iPad always needs to be held in one hand, limiting the use of many of the multi-touch features incorporated into so many apps (remote mixing apps for digital mixers, for example). The Two Hand Touch is an efficient and ergonomic solution that eliminates all of the problems of having to hold an iPad or tablet by putting it right where production pros need it to be - directly in front of them. It frees up both hands to interface with apps the way they were designed to be used, and to be available for all other work that needs to be done. Read more below. The Two Hand Touch is an iPad and tablet case built into a lightweight harness worn on the chest or abdomen. This puts the iPad in an easy line of sight, and more importantly, allows for use of both hands on the iPad. Remote mixing apps, DJ apps, lighting apps and many other wirelessly integrated apps are designed for multi-touch function which can be difficult to use when only one hand is available. The Two Hand Touch allows for full use of multi-touch features with both hands being available. When not in use the iPad can be flipped up against the harness and secured out of the way, up against the body. This reduces the risk of misplacing or damaging the iPad when having to put it down. By securing flat up against the body it allows the user to perform any other necessary tasks without the iPad being in the way, while still having fast and easy access to the iPad at a moment's notice. The front side of the Two Hand Touch has conveniently designed pockets and holders for all sorts of tools and devices that are necessary while on the floor. The compartments can hold various handheld and small items including: dB meter, radio, microphones, pens and pencils, picks, drum keys, allen keys, wrenches, patch cables, tie lines, pocket knife and much more. Gloves (Gig Gloves preferred) can also be clipped to a front loop when not being worn. The Two Hand Touch is available in two different sizes. One designed to fit the standard 9.7" iPad (GGTHT9) and one to fit the larger 12.9" iPad Pro (GGTHT12). Both models come with the exact same features, only designed to perfectly fit each of those most widely used iPad models. For users who are using iPad Minis, Android or other tablets that do not perfectly fit within the iPad sizing there are conveniently placed elastic bands stitched to the case that can securely hold tablets (and even phones) as small as 6 inches long. There is practically no tablet that the Two Hand Touch cannot hold. The Two Hand Touch design keeps the health and safety of production workers in mind by providing ergonomic support. Holding an iPad or tablet for a long time has been known to cause muscle cramping and repetitive motion type injuries in the hand. The Two Hand Touch relieves such pressure and cramping on the hand. It is easily put on via an adjustable neck strap, plus an elastic, dual-adjustable strap that goes around the back for a secure and comfortable fit. With a single click of the buckle the Two Hand Touch can go on and off.